Natural Skin Care Recipes For All Of Your Skin's Needs! Making your own natural skin care recipes is not only fun, but it allows you to have full control over everything you put on your skin. You can prepare these recipes ahead of time for your regular skin care routine, or just as a special treat for your skin every so often. A fun idea is getting a group of friends together and having each person bring one of the homemade skin treatments of their choice. That way everybody gets to try a variety of different recipes and also have a relaxing, luxurious evening. Not to mention everyone goes home with pampered and rejuvenated skin! Regardless if you use these natural skin care recipes every day or once a month your skin will love you for it and you will love you skin! To go straight to recipes, links are provided to the right or at the bottom of this page. If you have never made your own skin treatments before read through the following helpful information. What kind of equipment or tools do I need to make these natural skin care recipes? Chances are you probably already have most of these items. Below is a list of equipment you will need. Notebook or Journal This is for keeping track of any recipes you may altar. I know sometimes I like to experiment a little from time to time. There is nothing worse than having a recipe turn out just perfect only to realize you can't remember how much or what you put in it. Learn from my mistake! Write everything down! Labeling System For labeling your finished product. You do not have to get carried away with fancy gadgets. Making your own natural skin care recipes should end up cheaper in the long run, not more expensive. Jars you can find anywhere cheap or improvise with what you do have. (small canning jars, empty shampoo bottles etc.) Instead of a double boiler I put a glass bowl on top of an appropriate sized pot of hot water. The point is don't waste your money on stuff you don't need. Where Do I Get Ingredients To Make My Natural Skin Recipes? Many of our recipes call for very simple ingredients that you will already have in your kitchen. For the more uncommon ingredients like butters, essential oils, clays and salts and sugars there are many good companies online that sell these items in bulk. If you can't help yourself and you are one of those fancy gadget people, these companies often sell jars, molds and many other tools you may be interested in. At the bottom of this page are links to Mountain Rose Herbs, an awesome company that I use to get my supplies from. Have a look around their site if you are interested in checking out the cost of making your own skin products. If you want natural skin care that is organic always double check each ingredient for a certified organic seal. Advertisers can be pretty tricky with their wording on labels. A lot of companies put organic or natural in larger letters on their labels. If you read the smaller print underneath sometimes you find that there is only one so called natural or organic ingredient in it and the rest is chemicals! When making your natural skin care recipes be sure all of the equipment and ingredients you need is on hand and ready to go. I hate rummaging through the kitchen right in the middle of making a recipe. Being prepared ensures everything goes smoothly. Keep a journal of favorite recipes and always write down any changes you may make to them. This is good information to have especially if you make a recipe that turns out absolutely perfect. Chances are you won't remember if you don't write it down. Be sure everything is dated and stored properly. Unlike store bought products your own natural skin care recipes will not have chemical preservatives in them. They will go bad. Always remember to label and date you finished treatments. This next bit advice is very important. Always do a patch test before fully applying any of these recipes, especially on your face. Even though they are natural you can still have a chance of an allergic reaction like anything else. All recipes have been placed into different categories so you can more easily find the kind of skin treatment you are looking for. Start enjoying the benefits of these natural skin care recipes today! Here's to happy healthy skin! 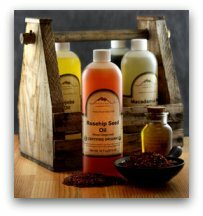 Visit Mountain Rose Herbs for all your natural skin care supplies. The Handcrafter's Companion has over 120 spa quality recipes that you can make at home. Recipes for handcrafted soaps, butters, bubble bath, bath bombs, butters and more.